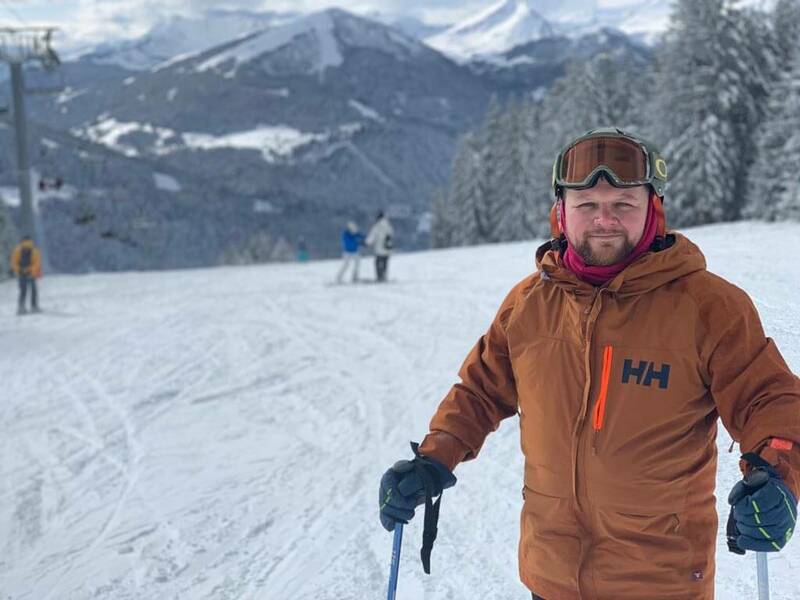 The ski holiday diary of Gavin Prior aged 38¼ (2nd time Simply Morzine guest). Well, you know it’s going to be a great chalet holiday when, at dinner on the first night, Robin jokingly replied to Alistair (who he’d met only an hour earlier) with a booming ‘yes Alison’. It was a quick-witted response to Alistair calling Robin ‘Batman’. Everyone around the table erupted with laughter. The ice had broken. Later that night, we all took it in turns playing our favourite songs on the music system, chatting about why the track meant something to us. Some were serious tunes with a story behind them. ‘This was our first dance’, or ‘my Dad played this to me when I was little’ for example. Some were less poignant, more pop. Even C’est La Vie by B*Witched and 50 Cent’s PIMP made an appearance, alongside classics from Bob Dylan, Queen, Oasis and loads more. A great evening sing-along was enjoyed by all. This kind of fun went on all holiday and we had a blast. What is it about mixed group chalet holidays that ‘works’ – every time? I can’t quite put my finger on it. 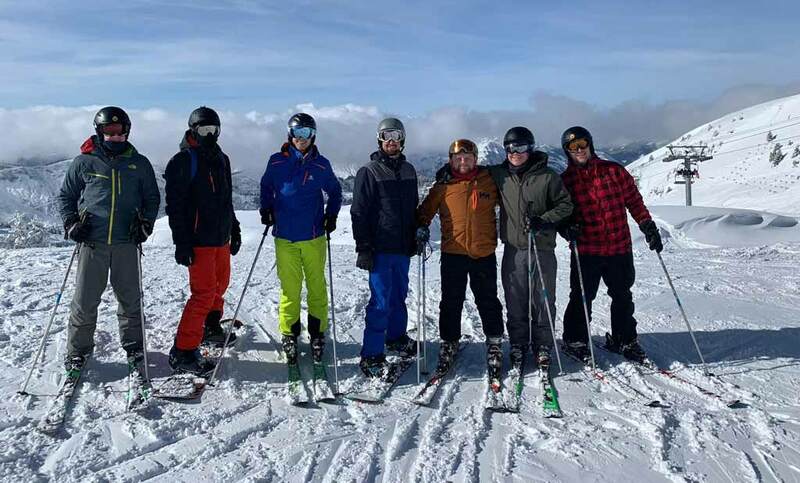 They do say that ski holidays are a great leveller, where everyone becomes equal, regardless of age or background. This couldn’t have been truer in my week. Maybe it’s the simple fact that everyone’s happy and on their ski holiday. Maybe it’s the lavish food and free flowing wine. Maybe it’s being in the cosy and comforting atmosphere of a chalet, with the log fire roaring and snow dumping it down outside? Or could it just be the binding mutual shared interest that is skiing? Whatever it is, there’s nothing like sharing a catered chalet with people you don’t know. Because you sure don’t know them for long. The fun (and snow) never stopped, all week long. We were a group of 7 men, taking a break from our busy family lives. 4 of us knew each other, while the other 3 were friends of mine from university who didn’t know the others. Robin’s girlfriend joined us for the second half of the week which was nice. One of the funniest things for me was discovering how passionate the 3 Cambridge Utd fans in our group (Tom, Matt & Robin) were about their little football club. On a chairlift we learnt about the team’s secret weapon back in the day. Apparently, they used to hoof the ball towards the corner flag each time because they’d grown the grass longer there. This meant it stopped rolling easier and gave them an advantage. The boys said this trick worked like a dream – until the rest of the lower league cottoned on to their cunning plan. The random things you learn on a ski holiday! I also learned that I was by far the weakest when it comes to getting up in the morning! The beds were just so comfy! Also staying at the chalet that week were a father and his 2 grown up sons, and 2 solo travellers. No one knew each other before the holiday, with the guests coming from all corners of the UK. So here we all were. Brought together by fate, a love of Morzine and a canny knack of picking the best chalet company around. No one took themselves seriously and everyone relaxed from the off. These were special moments in time that we all knew would never happen again. So why not enjoy every second? After all, this is what we work for. And that’s just what we did. 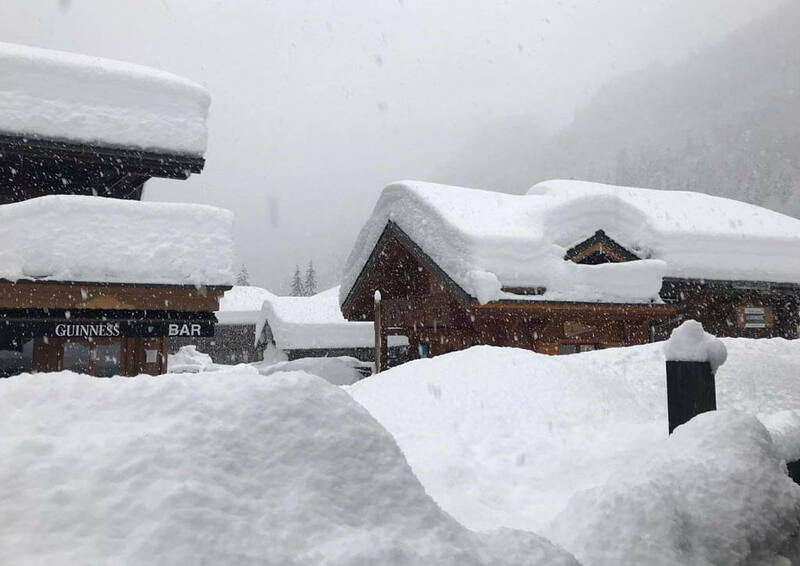 Heavy snow in Morzine – all week long! I quickly discovered that there’s always plenty of great skiing to be had in the Portes du Soleil. The ski area is massive and varied. 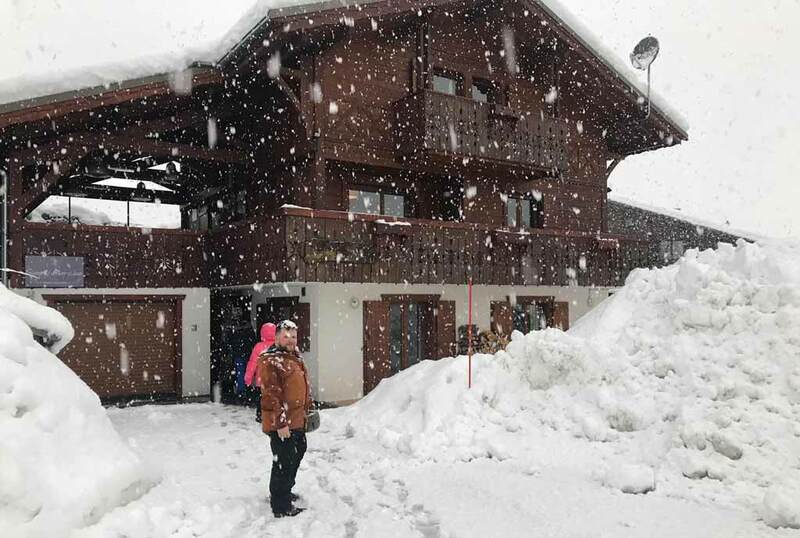 But this week we were extra lucky, because it didn’t stop snowing heavily. The locals said they’d never seen snow like it. One of the guys even described the huge snowflakes being ‘as big as a Weetabix’! I preferred my golf ball analogy. But put it this way – they were ginormous! Everyone in the chalet skied together some days, or we went off with our own groups. We often all met up in the Morzine bars for some great après ski. Or if we didn’t, we’d reconvene in the chalet’s outdoor hot tub, where we’d share tales of our day under the stars with a cold beer in hand. We joked about things like who’d fallen where and what happened. We laughed about our new pal Ian leaving his helmet on the bus after a couple of beers at the Happy Hours Bar in Ardent. Matt’s lack of powder skiing experience resulting in him digging his skis out for half an hour was the source of much amusement. 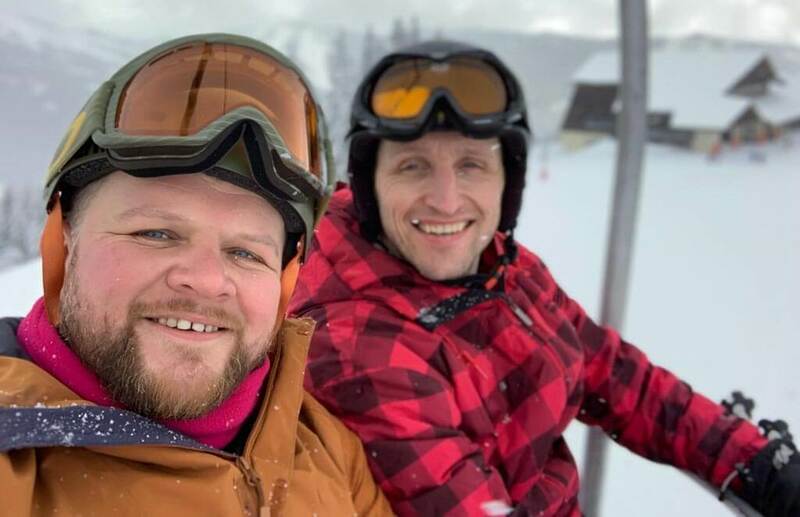 Robin and Tom said they’d never enjoyed such amazing snowboarding when they made fresh tracks through the trees at Super Morzine. Me forgetting to put my gloves in the drying room, so I had wet hands all the next day, made people smile, and a lot of respect was given to Dicky, who hadn’t skied in 10 years, but after a 2 hour private lesson on the first day, managed to dig in deep and ski with the rest of us all week. Well done mate! Highlights of the holiday for me included a long ski via Avoriaz through the ‘Happy Valley’ towards Chatel, before we crossed the border into Switzerland and Les Crosets. We skied for miles, with the Portes du Soleil winning hands down compared to all the other ski areas I’ve been to. On the Morzine side, I was pleased to tackle the famous, long Chamossiere red run, before spending a few hours cruising around the Les Gets bowl, with its range of wide blue and red runs. With everything buried in deep powder, I don’t think the snow conditions could have been more perfect. As a group, we headed to the Dixie Bar one evening to watch the brilliant Irish band, The Dixie Micks, who always put on a great show. We used the Simply Morzine resort shuttle service to make it back to the chalet just in time for the evening meal. On the staff night off, we feasted on Pierrade at Le Clin d’Oeil restaurant, which I can now highly recommend. After our meals, we headed to the hip Café Chaud, which was probably a little too cool for the likes of my group. But it was a good experience to see how lively the nightlife in Morzine can be for those who want it. Throughout our holiday, everything was taken care of, so we didn’t have to worry about a thing. Quick minibus airport transfers from Geneva took us to Morzine in style, before chalet Rep George welcomed us with an informal welcome speech as we enjoyed canapés and fizz on the first night. That helped because it meant we knew the drill. Dinner each evening was created by chef Joe. His food was fresh, beautifully presented, wholesome and tasty. Just what we needed after a long day skiing. Plus, Joe’s cheeseboards were a delight. Hosts Meisha and Mary were bubbly and charming, both always happy to join the conversation around the dinner table, whilst keeping the wine flowing! Breakfast was laid back, with a continental buffet spread and welcomed choice of hot dish every day, which Joe made to order. Then as soon as we were ready, the resort shuttle service whisked us off to our lift of choice (Pleney or Super Morzine) which helped us get out skiing quick sharp. We did feel lazy getting the minibus when it’s only a short walk, but it just made things that bit easier. 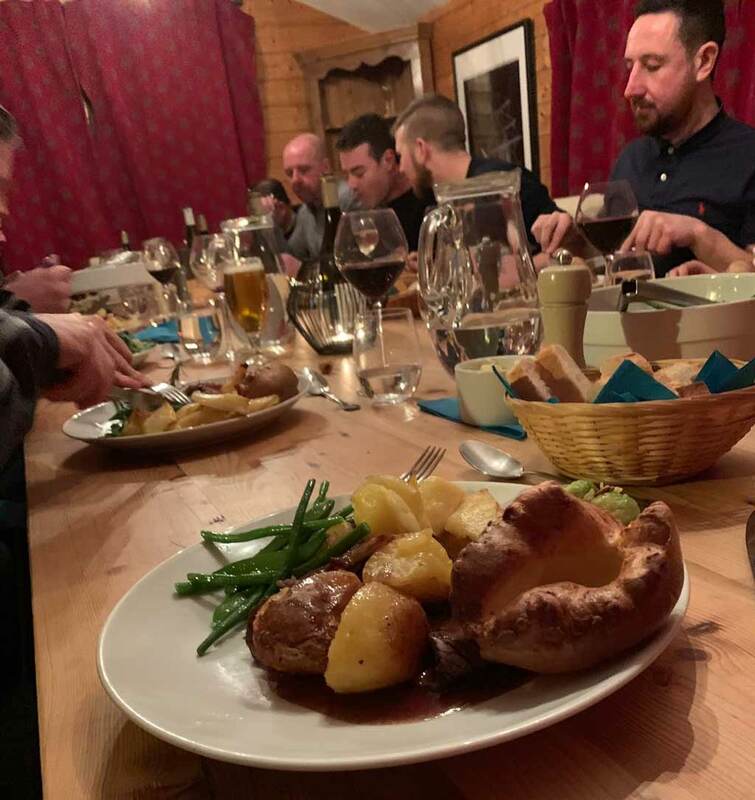 We skied hard every day and the informal luxury that a catered chalet holiday provides meant coming home at the end of the day to enjoy afternoon tea and cakes before jumping in the hot tub was a real treat. We either skied back to Chalet des Montagnes, or left our gear at Felix Ski Shop, who I must thank for heat moulding my new boots without charging. The service there is excellent. The very best thing about our shared chalet holiday experience was the Simply Morzine staff. They beavered away quietly in the background, to ensure the perfect cosy and welcoming guest environment. They were all professional-yet-informal, with attention to detail that really made a difference to our stay in Morzine. We did just feel a little sorry for the team because there was a lot of snow clearing to be done! By Gavin Prior, aged 38¼. If you’d like to discuss a shared catered chalet holiday with Simply Morzine, please get in touch. Full weeks and flexible short midweek or weekend breaks are available on selected dates throughout the winter season.